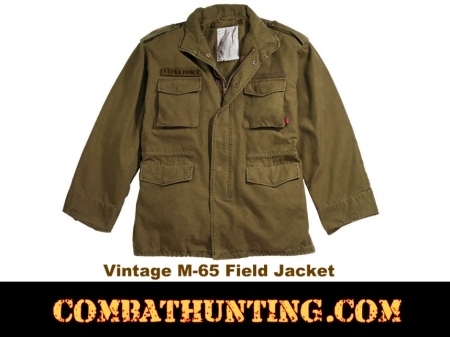 Rothco Russett Vintage M-65 Field Jacket Are Made Of Cotton. Nothing says vintage military clothing like an M65 Jacket! Rothco’s Vintage M65 Field Jacket features a super soft 100% washed cotton outer shell and lining. The M65 jacket also features a concealed hood, heavy brass zipper & snaps up storm flap, 2 hook & loop chest tabs lining and a removable Rothco Name Patch.